Babblings of a Mommy: Seeing Spots. There's no doubt that polka dots are THE trend for fall. It was all over the Fall 2011 runway from Lanvin to Gucci to Marc Jacobs and Diane von Furstenburg, and you know that if all these fabulous designers have the same print on the runway it definitely the "it" trend this season. The good thing is that if you're not a big polka dot fan you don't have to dress up from head to toe in spots--just choose a small accessory like a scarf or clutch to keep on trend and do your own spin on it. What do you think of the polka dot trend? Will you be rocking it this season? Ooohhh, I love polka dots!! Regardless of what season it is or how 'in' it is, I think I'm definitely going to get me some polka love!! Love the polka dot trend! 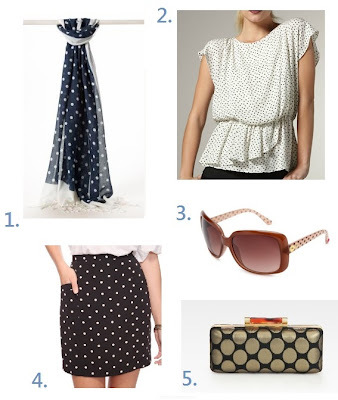 My outfit post today is actually polka dots and I bought a polka dot skirt this weekend! I like the look of polka alot. I think it has nice polish, professional look with a little quirk. I'm a total sucker for polka dots - I'm so glad they're "hot" again!